SkyGate designs wall decal stickers that are easy to use - and reuse. Decorate and accent the walls in your home, school, office, kid's room, or nursery. Use these 3D kids wall decal stickers for educational purposes at school or daycare. Our adorable Amazon Animal stickers are also perfect for use in professional offices such as pediatric dentists, physicians, and optometrists. When you use our eco-friendly wall decals, you add warmth to any room you choose, immediately transforming a familiar space with new charm. We manufacture our products using materials that are safe for people and for our world. SkyGate has designed these reusable wall decorations that are environmentally and ecologically friendly. We have decals with Safari animals, vehicles, butterflies, flowers, and more. The special design of SkyGate 3D foam wall decal stickers allows them to really stand out. The adorable designs and bright colors pop off the wall. They are shipped flat, never rolled or folded, so you don't have to worry about annoying creases or curled wall decals. They hang easily with a strong adhesive that doesn't leave a sticky residue behind, and you can remove and reuse them again when you are ready to change decor. SkyGate has healthy happy kids in mind when we design our foam wall decor for children. Made from a foam material that is an Ethylene-vinyl acetate (EVA) copolymer, it is non-toxic, has good biodegradability, and is resistant to UV radiation. EVA weathers well and is sulfur-free, ozone resistant, and recyclable. Kids love talking about these bright colorful 3D wall decals that encourage verbal conversations, speech development, and imaginative play. Put a personal touch in any room with SkyGate's wall decals for kids rooms. Decorating is simple with our peel and stick wall decals. It's a fun way to add personal decor to your home, school, or professional office for kids. Decals also make a creative and unique baby shower gift or present for any occasion. ECO-FRIENDLY KIDS WALL DECALS: SkyGate has designed wall decor for kids that is environmentally and ecologically friendly. 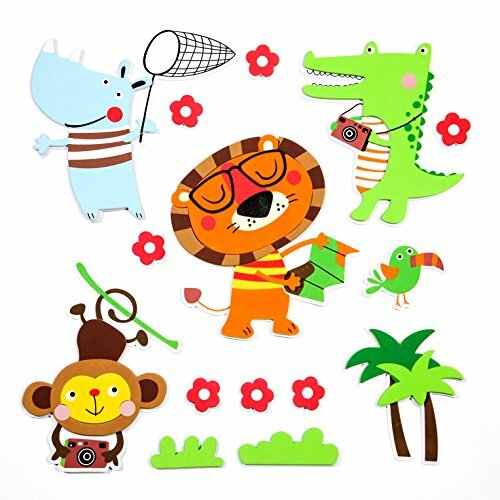 These Amazon Animal 3D wall stickers add instant decor for kids rooms, nurseries, or bathrooms. Add color and charm to classrooms or doctor offices by simply adding wall decals. We manufacture our products using materials that are safe for people and our world. 3D WALL DECAL STICKERS: The special design of SkyGate 3D foam wall decal stickers allows them to really stand out. The adorable designs and bright colors pop off the wall, adding instant charm to any room. Our ⅛" foam 3D decals are shipped flat, so you don't have to worry about creased or curled decals. They adhere to surfaces without leaving a sticky residue. They are removable and reusable wall stickers. COLORFUL SAFE WALL DECOR: SkyGate has healthy happy kids in mind when we design our foam stickers for kids. Made from a foam material that is an Ethylene-vinyl acetate (EVA) copolymer, it is non-toxic, has good biodegradability, and is resistant to UV radiation. EVA weathers well and is sulfur-free, ozone resistant, and recyclable. Our safe and reusable wall stickers are the perfect wall decals for girls, boys, and babies. PERSONALIZE YOUR SPACE: Put a personal touch in any room with SkyGate's wall decals. Decorating is easy and fun with the many different choices and colors available. Let your kids decide where to put them - or surprise them with a new look using wall stickers for kids bedrooms, playrooms, or bathrooms. Hang these adorable Amazon Animal stickers up at school or in professional offices for kids. VARIETY OF PURPOSES & USES: SkyGate's easy peel-and-stick wall decals have been used in any space kids enjoy or frequent. They look great for decorating kids' rooms, playrooms, and nurseries. The decals also stick on bathtub surfaces. Preschools and daycares love using them to decorate and differentiate separate spaces. We also have Safari animal stickers, vehicles, sea creatures, butterflies, and more. If you have any questions about this product by Skygate, contact us by completing and submitting the form below. If you are looking for a specif part number, please include it with your message.